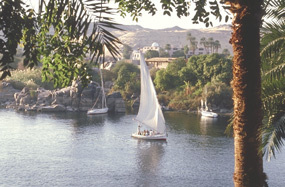 Aswan is located about 850 km south of Cairo and is one of the most beautiful winter resorts in Egypt, because of it's dry and mild climate. Although bustling activites dominate in the narrow alleys of Aswan, especially around the bazaar which is about 3km long, the city gleams with calmness and relaxation for visitors. Aswan with it's estimated 150,000 inhabitants is also very important for the economy of the ountry.The Aswan High Dam, with it's length of about 4km and a height of 111 metres regulates irrigation demand and electricity for almost the whole country. 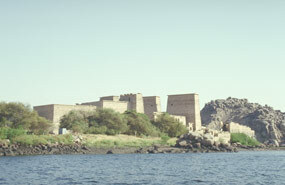 This island was one of the strongest forts along Egypt's southern border. It's chief deity was "Khnum", in the shape of a ram's head, as the creator of humankind and god of the cataracts. Near to the museum, which is located east of the remains of an ancient settlement and houses a number of important relics from the Graeco-Roman era, is the Nilometer, dating back to the Roman period, showing the height of the Nile floods in Greek, Demotic and Arabic inscriptions. This huge unfinished obelisk measures 41 metres in length and would have weighed 1680 tons when finished. 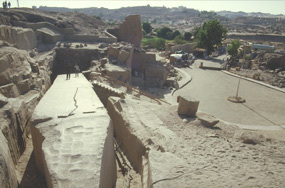 It is important, because it shows the techniques adopted by the ancient Egyptians in cutting out these obelisks of granite rock. Dating back to the 6th century AD, the monastery can be reached by foot or by camel. Inside the monastery the remains of a roofless basilica comprises well preserved frescoes. It is 2 km long and about 51 metres high. 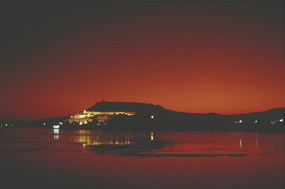 The new high dam was built between 1960 - 1971 in co-operation with the former Soviet Union. The High Dam is 111 metres high, about 4 km long and 40 metres wide at the top. At the base it reaches a width of 980 metres. The dammed Nasser Lake is 550 km long, taking it well into Sudan and creating Lake Nasser, the world's third largest artificial lake. One can buy spices at a favourable price at the spice market. mallow and tamarisk blossoms are also offered for tea preparation. 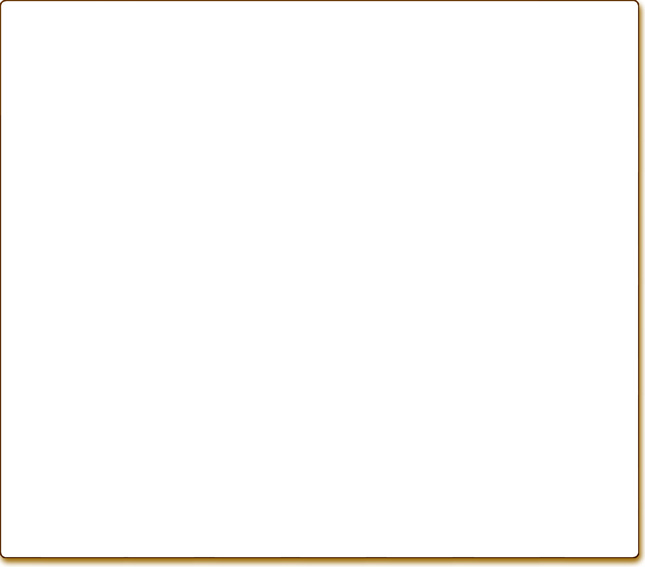 Galabeyas, jewellery and other goods can be bought. It comprises a courtyard, a hypostylehall and a kiosk with multicoloured texts and inscriptions, as well as scenes of the king on the battlefield. Dating back to the Roman Emperor Octavius Augustus (30 BC - 14 AD), the temple was moved from it's original site 55 km south of Aswan, on the west bank and rebuilt 1 km to the south of the High Dam. The temple was dedictaed to a local god called Mandulis. 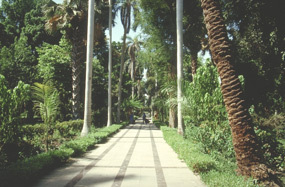 Also called Kitchener Island, is a botanical garden with equatorial tropical trees and shrubs, perfect for a peaceful stroll. 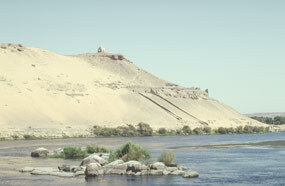 The Temple of Goddess Isis of Philae, built of sandstone, was dismantled after the construction of the Aswan High Dam between 1973 - 1981 and re-built on the island of Agilika. The temple, is one of the best preserved Graeco-Roman temples, constructed between 250 BC and 111 AD. The Mausoleum of the deceased leader of the Ismaylia sect in 1957, stands on the west bank opposite of the Old Cataract Hotel. It is an exquisite example of Islamic architecture. The northern hills of the west bank are filled with rock-cut tombs of princes from the Old and Middle Kingdoms, dating back to the 23rd century BC. The inscriptions covering the walls of these tombs depict the role of these nobles in protecting the southern border of Egypt and of their journeys to other African territories. 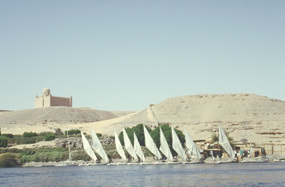 The first dam in Aswan was constructed between 1898 - 1902 AD and after two raisings, in 1912 and 1934 it was considered a basis for modern irrigation. These temples were transferred because of rising waters of Lake Nasser. 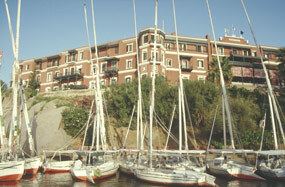 One can visit them at best during a Nile cruise on Lake Nasser. Both temples in Abu Simbel can be reached by air. 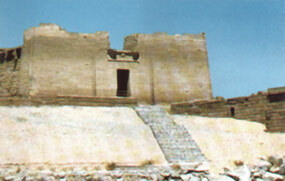 The Bait-el-Wali Temple was re-constructed 100 metres away from the Kalabasha Temple. This rock-hewn temple is one of the five temples built by Ramses II in Nubia. It comprises a courtyard, a hypostylehall and a kiosk with multicoloured texts and inscriptions, as well as scenes of the king on the battlefield.